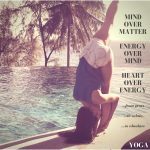 MIND OVER MATTER, PRANA OVER MIND, HEART OVER PRANA. Yan is dedicated to sharing the knowledge and experience of the techniques, effects and benefits of the ancient yogic and spiritual practices, including physical asana, breath and subtle energy work, meditation and yogic lifestyle, virtues, philosophy, diet and fasting, through yoga immersions, courses, workshops, classes and personal sharing in writing and video logs. “Yoga is truth, consciousness, bliss.